Peter Viney on "Bessie Smith"
Thanks for contributions from the Guestbook(s). 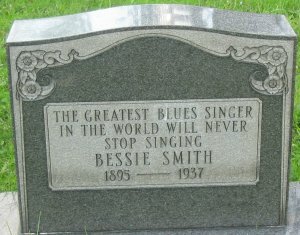 Bessie Smith first appeared on The Basement Tapes in 1975. It was immediately noticeable for the outstanding anthemic quality of the song (why hadn't they released it before?) and more dubiously because the sound and production quality was markedly better than most of the other tracks on there. 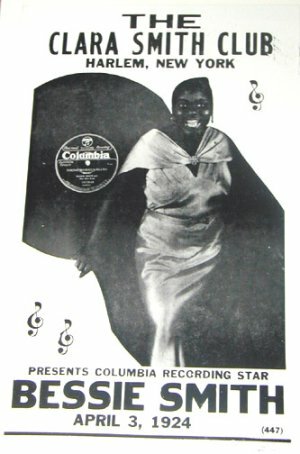 Bessie Smith would fit onto any of the early albums. Robbie and Rick, who wrote it together, sing it together, with unusually Robbie taking lead. It's a vocal blend which works superbly, but which is rare in their later work. There is a touch of recording muddiness on the vocal which pulls it below the Big Pink sound, though the organ is piercingly clear and the bass rolls along. The singer takes the fictional persona of an old flame of long-dead blues singer Bessie Smith (1892 to 1937) who's on his way to see her. Robertson acts out a role throughout and ends up with the singer's dilemma -- in reverse -- the narrator can't decide whether he's in love with Bessie or her voice. The lyrics are as transparent as The Band got in those years, and it starts out with a blues cliché Going down the road... perhaps second only to Woke up this morning ... as a starter line. The link to The Band's late '60s work is that you can read it as a song set in the past with someone going to see their old flame Bessie Smith in the 1920s or 1930s, or more ominously Bessie is an appointment with death, if you see the singer as in the here and now going to the old flame who has already passed over. Mind you, he would have been getting on a bit even in 1967! While the song is about Bessie Smith, there's no attempt to echo her style or sound in it. The original sleeve notes to the double album suggest that Levon was back from his nearly two year exile for 'the tunes by The Band'. As he arrived late on, this is a pointer to some at least of these songs being post-basement. It didn't take long for listeners to figure that the Band tracks on The Basement Tapes might date from later than the rest of the Dylan / Hawks material. They were clearly studio rather than basement recordings for starters. Clinton Heylin in the opinionated Bob Dylan -- The Recording Sessions rails against Robbie's 1975 production. Heylin is more paranoid about Robbie than Levon on a bad day, suggesting the whole concept was designed to play down Richard Manuel's role as The Band's first writer. This is nonsensical, as while You Say You Love Me and Beautiful Thing may not have made it to the 1975 album, they are only fragments of markedly lower fidelity than the songs that did. And Robbie wrote Ferdinand the Imposter, not Richard. This should have been obvious to anyone with a passing acquaintance with Robbie's interest in the Trickster motif, and was confirmed with its official release as a bonus track on the Music From Big Pink remaster in 2000. Not only that but if you go back to Ronnie Hawkins Mr Dynamo or the Levon and The Hawks singles, Robbie was already 'a writer.' Furthermore, the inclusion of Tears of Rage (Dylan/Manuel), Katie's Been Gone (Robertson/Manuel), Ruben Remus (Robertson/Manuel) and Orange Juice Blues (Manuel) hardly suggests a conspiracy to play down Richard's contribution. Heylin even disputes Levon's version of which tracks he played on, archaeology taking precedence over personal memory. Levon is quite clear that Bessie Smith was among the songs he was shown immediately on his return to the fold in the late Fall of 1967 8 (Which doesn't help us with when it was put on tape). Note that Levon says it was 'Rick's song'. If we accept the co-credit, I'd guess Rick melody, Robbie lyrics. The melody has echoes of other Rick songs, while the role-playing narrative set in a different era is classic Robbie. Heylin also says that two tracks were Richard Manuel demos with piano only, on which the complete backing was done in 1975, and the rest were heavily overdubbed by Robertson. Robbie Robertson has categorically denied this. The most disputed tracks are Bessie Smith and Ain't No More Cane, allegedly produced by Rob Fraboni in new versions in 1975. It was later reported (at second-hand) in the Guestbook that Rob Fraboni was the source of this information. There is a circulating tape of Band-only basement sessions, which was due to become the sixth volume in the bootleg series The Genuine Basement Tapes. It was never released. This includes unreleased items, like a guitar instrumental version of Ruben Remus as well as other versions of Orange Juice Blues and Yazoo Street Scandal. Most significantly, Bessie Smith isn't on it. It was alternatively suggested that Bessie Smith was an earlier studio recording, and the 1975 "mixing" had actually been a case of remixing the song to make it sound more lo-fi and primitive, so that it would appear to come from the basement at Big Pink. Then the original source for the recording could have been The Band's demo session for Albert Grossman at Columbia Studio E on September 5, 1967.10 In which case, they didn't make it sound primitive enough. In 2000, the Band albums were remastered, and Bessie Smith appeared as a bonus track on 1971's Cahoots. It sounds richer and fuller, but it's the same recording. Don Juan, in Carlos Castaneda's saga, urges Carlos to 'erase his personal history' and it might be that the line stuck in Robbie Robertson's head. It must be said that if any subterfuge did take place, all the Band members were part of it, as was Dylan, and no one blew the whistle. Unfortunately, The Band have a steady history of falsifying song origins. Live At Watkins Glen is a total fake, largely made up of Rock of Ages outtakes and studio left-overs. The Last Waltz is heavily overdubbed. Some of Rock of Ages stems from the afternoon rehearsals, not the live concert (which accounts for the fabulous sound balance). And some of the Band tracks on The Basement Tapes -- such as this song -- date from later than 1967. If they had Bessie Smith knocking around at the time of Cahoots, they were foolish not to use it. It would have been one of the best three tracks, if not the best. So it's now switched from between the second and third albums, to between the first and second. If it was that early, it would have been easier to change the name in Up On Cripple Creek to Rosie or Betty or Nancy or whatever, than to scrap the song. Robbie's earlier quote, placing it between The Band and Stage Fright says they'd already used the name. While Bessie in Lake Charles, Lousiana could have become Betty without much trouble, Bessie Smith is a real person. It is a straightforward song, but it's an excellent example of Rick Danko's melodic gift, and a rare example of Robbie as lead vocalist. It may have been unimportant to them at the time, but Jeff Tweedy of Wilco and Norah Jones both note it as a favourite song. So the song was known to be around earlier than the 1975 recordings or mixing sessions with Fraboni, and it's unlikely that they didn't commit it to tape at the time. I'd take Levon's word that it was written in the basement era, regardless of when it was recorded. Whether it was twixt Big Pink and the Brown Album, or just after the Brown album, we won't know. I'm prepared to bet that Heylin was totally wrong and that the recorded version does not date from 1975. We know that The Band did New York sessions on September 10th 1968, trying out studios as potential sites for the follow-up to Music From Big Pink, and that Key to The Highway released on the Music From Big Pink remaster in 2000 comes from this session.19 I'd say that this was recorded in a different space to Bessie Smith -- the ambience is quite different. But some recording was taking place between the first and second albums, as Robbie's "second" fairly certain memory suggested. I can't hear Levon on backing vocals at all. There is some evidence in the arrangement. If it had been intended for The Band album, it seems likely that there would have been a wider, more eclectic range of instruments used. Its basic line up suggests earlier. These are all the same version. There are no known live recordings. 10 See Harm Van Sleen, Mixed Up Confusion on The Band site.